We are Branson Karate and teach the style of Seiyo-No Shorin-Ryu Karate. Shorin Ryu is a traditional style of defensive martial arts. Shorin Ryu focuses on the whole person, mentally, physically, morally and spiritually. Briefly speaking Shorin Ryu Karate uses the “jitsu,” physical techniques derived from the combative arts of the Chinese, Okinawan, Korean and Japanese, to “Maximize students strengths and minimize weaknesses,” through strong powerful and circular techniques, (kicks, strikes, blocks, throws and weapons). An equal application of hand and foot combinations makes this a true martial art. In Shorin Ryu Karate there is an adherence to tradition. Training Hall Etiquette and philosophical principles underlying karate are taught and encourage application in everyday living by the karate student. Principles such as, Self Discipline, Respect, Humility and Spiritual Strength are taught. The objective of Shorin Ryu Karate is not to stop at learning superficial movements. It can show the way for us to seek unlimited expansion of the limited mental and physical power, we have placed upon ourselves. Shorin Ryu Karate is for everyone (age 4 to 75). You may join at anytime, we are open year round. Our practice methods do not condone deformation of any body parts. There are ten degrees below Black Belt and ten degrees of Black Belt. We are a branch school that is Nationally and Internationally affiliated and Certified. Kokusai Seiyo-No Shorin-Ryu Karate/Kobudo Renmei is affiliated with The All-Japan Seibukan Martial Arts Association. 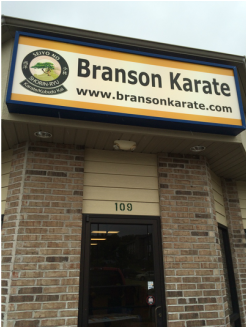 Our branch school is located in Branson, Missouri. Enroll in a Beginning Karate Class! This is a great opportunity to experience Shorin Ryu Karate with at a special trial price! Experience 4 classes for $29. Basic instruction in blocks, kicks, stances, falls and self defense. Note: You do NOT receive a uniform with this package. If you choose to purchase one they are $30. After your four trial classes, should you choose to continue your training, we will prorate our 1st month package to $60 and you will receive a karate uniform and white belt. New Student Package: 8 Classes - INCLUDES Uniform! Whether you are a child or an adult, if you are looking to get started with karate, this is a great introduction to the martial arts at a discounted rate! 8 - karate classes: Includes basic instruction in blocks, kicks, stances, falls and self defense. Class times are held year round on Tuesdays and Thursdays. You may start classes at any time. We have dedicated instructors for new students. New students should attend the class time suitable for their age. To purchase this new student package, select the student's uniform size below. See sizing chart in the images. The uniform will be available for you at the dojo for your first class . After the 8 classes, should the student wish to continue their karate training, unlimited classes are $70 per month. We also have 6-month and Annual packages ranging from $58 to $45 per month respectively. NOTE: Offer good for new students only. As classes fill up quickly, offer may be discontinued at any moment.